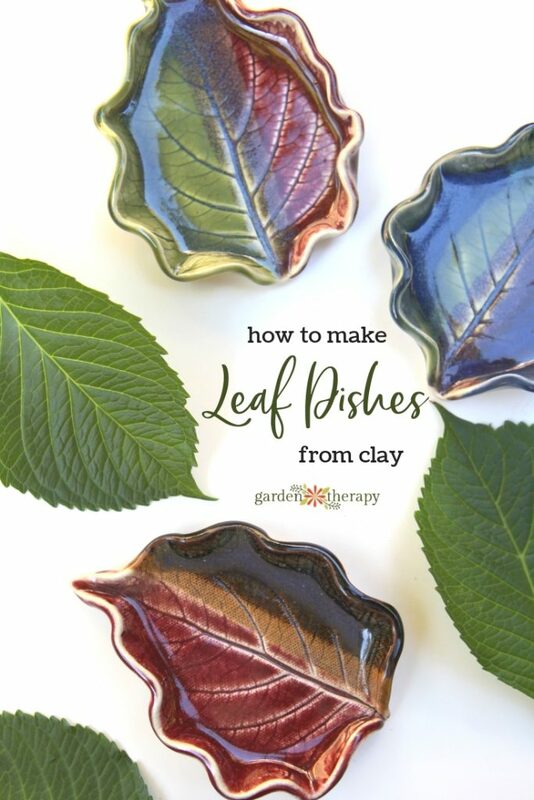 These clay leaf dishes are a project you can do anytime throughout the year. Head out to the garden and look for unique shapes to preserve. Perhaps you have a special tree that you’d like to commemorate? I know that I can get very sentimental about my trees, and this is a nice way to preserve the leaf of a loved tree for years to come. 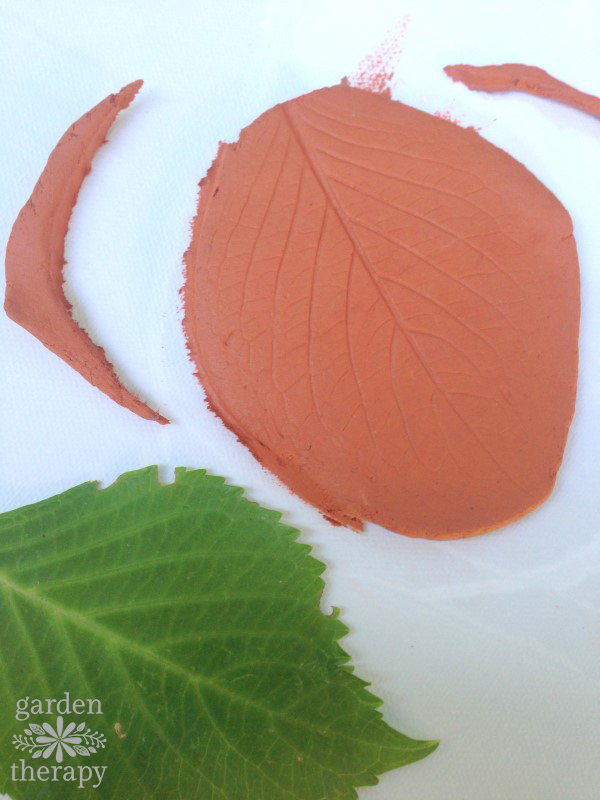 Once you’ve chosen your leaves, then it’s just a matter of using clay to mold them and paint to decorate. 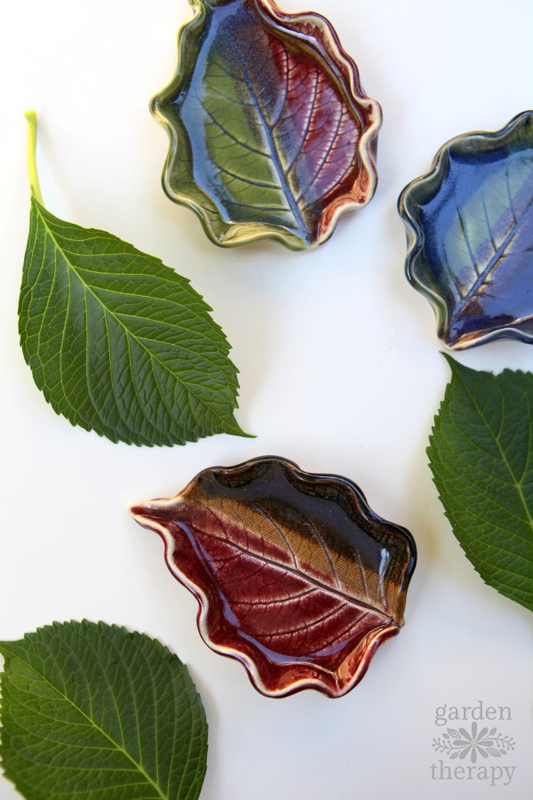 You can make these at home and finish them with a coat of paint or head to a local pottery studio and use a kiln to glaze them, but no matter how you decide to finish them, here is how to make these lovely leaf dishes. When choosing leaves, look for those that are still supple, as dry leaves may crack and break before you get a good mold from them. Leaves that have interesting shapes like oak and maple will make bowls with deeply grooved edges, making them interesting yet impractical for holding much. 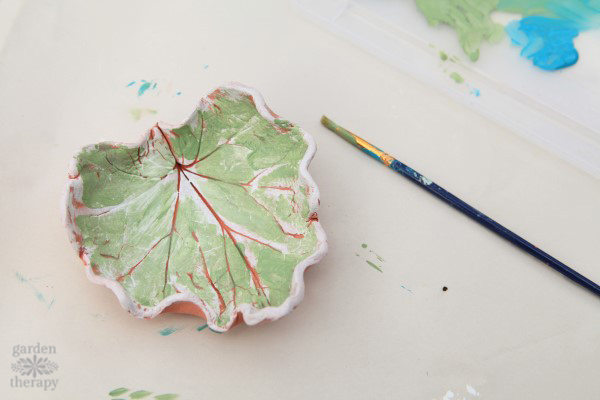 I like to use smooth-edged leaves with a fairly large size, about as big as the palm of your hand for a small pinch bowl or as large as your whole hand for a decorative jewelry dish. Hydrangea leaves make a perfect bowl shape and you can ruffle the edges for a bit more decoration. And long leaves make an interesting ring holder. Air dry clay is an easy material to work with, but it’s not as durable as kiln fired clay. Air dry clay can break easily and turn to mush if left outside in the rain without sealer. The good news is that it is really easy (and fun!) to work with so it is worth taking a bit of extra care. Make sure that you work out the bubbles before you mold your clay. If your clay is new from the package you can cut off a slab and roll that out without too many air bubbles. If you have a ball that has been previously handled, you can work out the bubbles by kneading the air bubbles out. Potters call this “wedging.” While this is absolutely necessary in kiln pottery, air dry clay is a bit more forgiving. See how to wedge clay in this video and use it to reshape your clay and remove air bubbles. Air dry clay dries out very quickly. 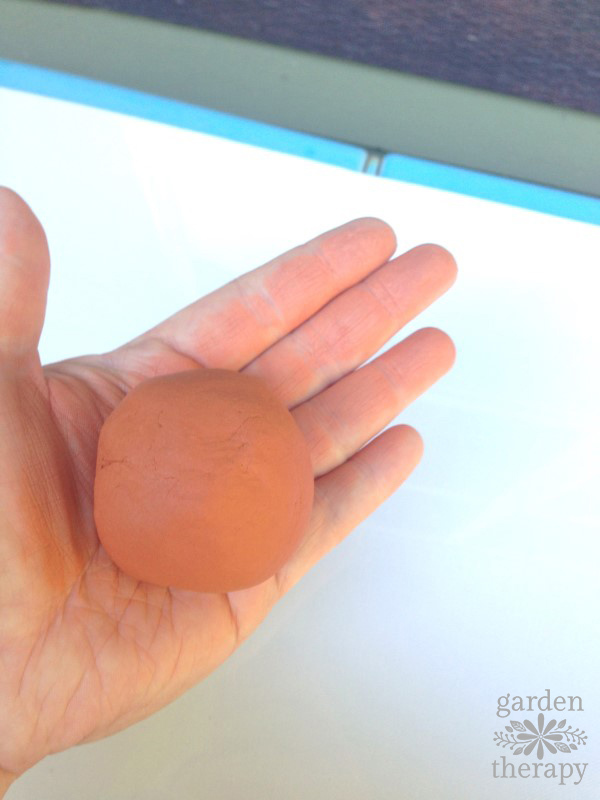 To avoid cracks, keep your clay moist and smooth out any cracks with a wet sponge before allowing it to dry. Dry air dry clay slowly in a cool room. Check it often to make sure the shape is holding as the edges can curl up. When the clay is completely dry, paint it and use a clay sealer to protect the finished piece. With these tips, air dry clay is an easy way to start sculpting! Start by removing a section of clay from the block using string or dental floss. Wrap the string around your 2 index fingers, the width of the block apart and use it to pull through the clay to cut off a chunk. Start at the back and pull towards you. 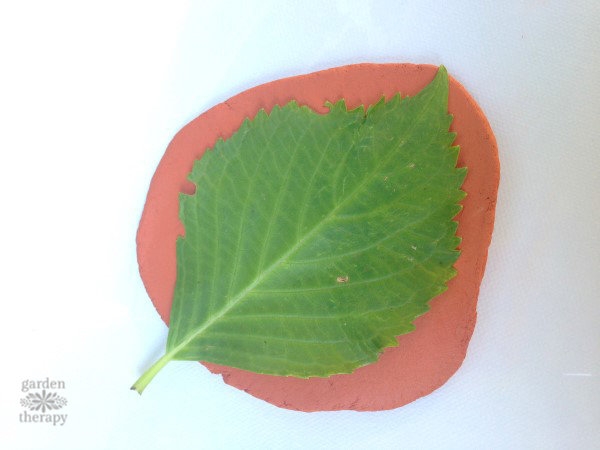 Roll out the clay to 1/2 inch thickness and place the leaf, with veins facing down, on the clay. 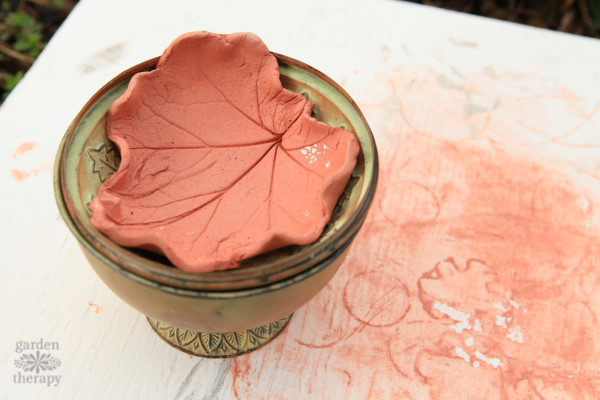 Use the rolling pin to gently imprint the leaf’s details and shape into the clay. Use a sharp edge of a knife to cut out the shape of the leaf and pull the leaf off. 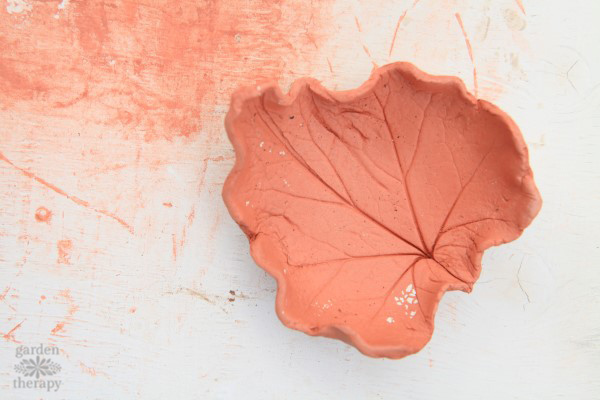 Cup the finished clay leaf in your hands and gently work it into a bowl shape by curling up the edges. To ruffle the edges, use both hands to curve the edges back and forth, creating a wave pattern. 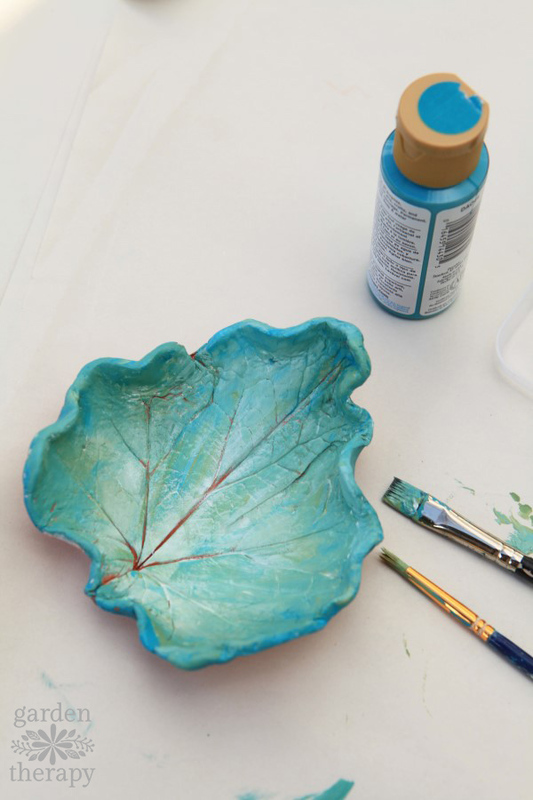 You can set the leaf in a shallow bowl to dry and take on the shape, or roll up some newspaper to set under the edges of the bowl. This will make sure it keeps the curved shape as it dries. After the clay is completely dry, you can paint it any way you like! From simple white to multicolored, a set of craft paints will transform it. Try painting geometric shapes, splatter painting it Pollock style, or adding your own touch. Use a gloss or matte sealer to protect the finish and set it out to enjoy. 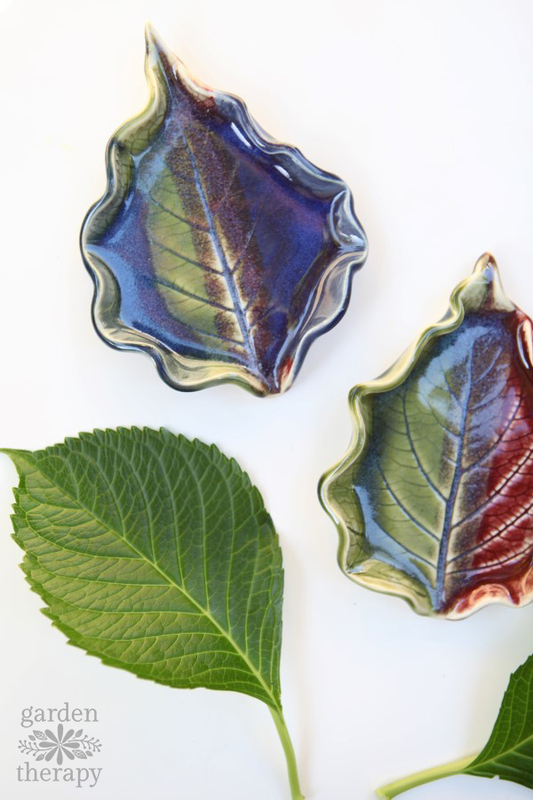 Note: these clay leaf dishes are decorative and not meant for food. It is not possible to wash them or submerge them in water. It’s best that they are used to show off pretty collections or other small items you want to display. If you want to have food-safe dishes, join a pottery studio and make this simple project there! You don’t need much experience and you can make beautiful designs with the glazes. Here are some that I made in a pottery studio with the hydrangea leaves. I use these as soap dishes for my handmade soap at home and as gifts. I would love to do this craft at my public library. Could I use your image to promote the craft? I would cite your blog as the craft source. Also, how many bowls will 2.2lbs of clay make? What glaze did you use to get this finished product with the rainbow irridescent appearance? Hi jennifer, I used three glazes for each of them. I dipped one glaze on one side (red for example), then one on the other (eucalyptus for example, then a third iridescent one three quarters of the way (teal for example). I don’t know what the exact glaze names are but the application pattern should help you recreate it. Best of luck! 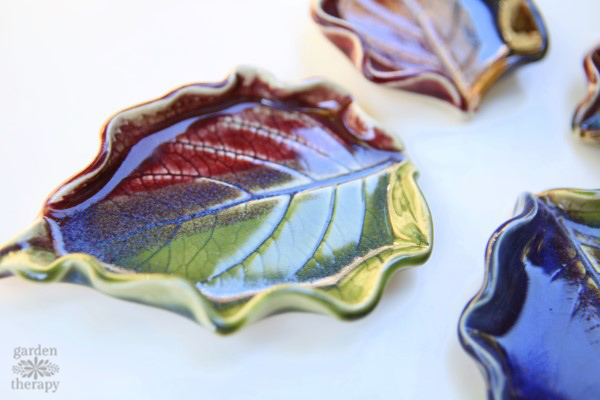 Is there a way to get a shiny glaze on the air-dry clay leaf trays like the one on the kiln fired ones? Try ArtResin. It’s wonderful. Check out their website.